Britosterope® fencing panels are an extra-sturdy fence consisting of large monolithic modular panel obtained by electro-welding vertical bearing flat bars and horizontal round transverse bars, which offers a high level of security. 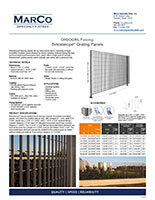 Britosterope® grating panels match solidity and safety with a pleasant look. 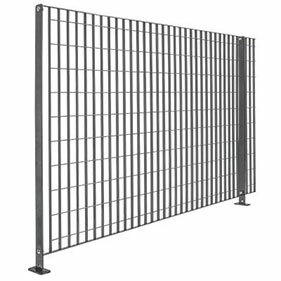 Britosterope® electro-welded mesh fencing consists of modular monolithic panels, not joined nor welded side by side, with a height of … inch, width 6′-6 27/64″, mesh size 2 7/16″ x 5 13/64″, with 1 13/16″ x 5/32″ vertical flat bar (center distance 2 7/16″) and 1/4″ diameter horizontal round bars (center distance 5 13/64″). The 1 13/16″ x 5/32″ flat bar horizontal frame elements are bent at the ends for a length of 1 37/64″ and are slot drilled 15/32″ x 5/8″. The horizontal frame elements are electro-welded to the vertical posts by fusion without additional material. Post center distance is 6′-6 47/64″.